Haridwar has become the source of attraction of many as it is considered to be the paradise for nature lovers. 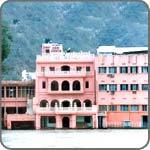 We are also counted among the famous service providers of Hotel Accommodation In Haridwar. The 3 Star Hotels In Haridwar are located at the most prime locations and also close to various tourist visiting spots. Moreover, Ginger Haridwar is counted among the most reliable Hotels In Haridwar as all the essential facilities are encompassed to make you trip the most memorable one. Customers are also facilitated with the availability of rooms in hotels in Haridwar at affordable prices.